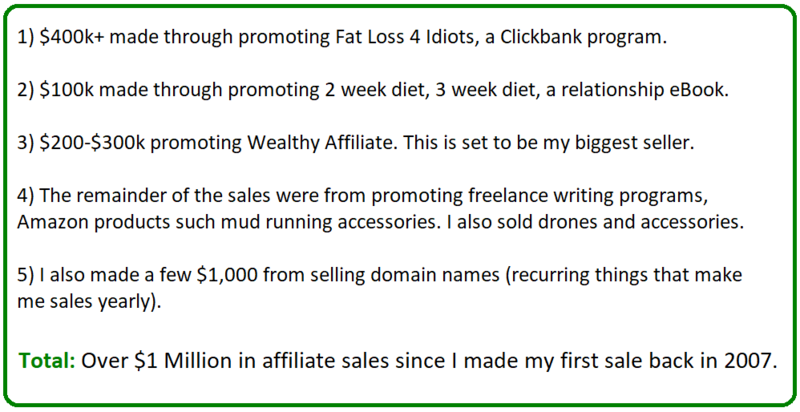 How Affiliate Marketing Made me $1 Million. A Complete Guide. I started affiliate marketing 15 years ago, and have made over $1 million since. This complete guide will explain how I did it, and it’ll be beginner friendly. The purpose of this guide isn’t to show off the stats, it’s to actually help YOU do the same or even better. There’s many people out there who wish to do this for a living or make a side income from it and I’m here to tell you, with proof, with success stories, and with a step-by-step guide, exactly how you can do this too. Part 1) First, I’ll provide stats of my earnings, so you can see that the $1 million in sales is true. Part 2) Then I’ll discuss WHAT exactly affiliate marketing is. Part 3) Followed by that, I’ll describe in detail how it works and the one formula that if done right, will make you succeed at it. Part 4) Next, I’ll provide you with 7 different strategies and ways you can do affiliate marketing legitimately using the same one formula for success. In other words: 1 formula, 7 different ways to use it to get results. Part 5) Following up on all this, I’ll provide COUNTLESS success stories of people who have also succeed at this business, all of which used this 1 formula. Part 6) Then I will explain something that most people do not cover: Why the success rate of affiliate marketers is very low (and how to make sure when you start, that your odds of success are HIGH). Part 7) I’ll personally show you how to start an affiliate marketing business from nothing (free) and grow it to the levels I did as did the people in the case studies I’ll cover here. Long. Grab a coffee people, I’m going into deep details here and holding nothing back. Most of what other gurus sell on this subject through training, programs and coaching, I’m giving to you here, for free. No sugar coating. I’m not here to sell you a false dream of how affiliate marketing is easy. It’s actually hard in the beginning and if you don’t have the right mindset or training, you WILL fail. My job is to help you avoid that high failure rate and get you to succeed, so read this guide with an open mind to ensure that happens. Transparent. While the information, tips and guide to success is free, to get started, I will be recommending you join one program (it’s free to try) and I am promoting it…as an affiliate. It’s optional to join it and your success in affiliate marketing doesn’t rest on it (but it sure does improve the odds). Open to any questions on affiliate marketing. While I am giving you a TON of info here for free (I wasn’t kidding when I said complete guide), you will obviously have questions. I want to encourage you right now to first read the entire guide, and then compile your questions and ask them below. Do not be shy about this because that itself holds you back from starting what could be a potentially profitable career in this business and I am very opening to answering questions. Now here is a breakdown, screenshots of some of the sales activity (I didn’t record all of it, sadly), but the links take you to the individual case studies that’ll further break everything down. You are welcome to read the extra material, or you can choose to keep reading this blueprint (or both, it’s totally fine :)). Sales reports and so on are found here. 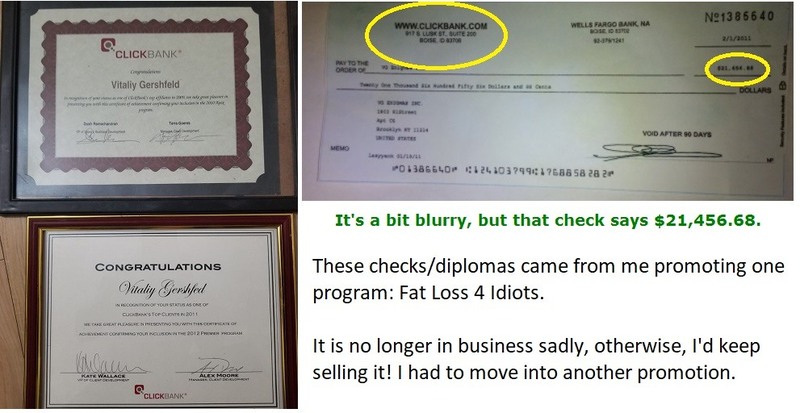 First, I have 2 diplomas/certificates from Clickbank itself which basically rewarded me for making them so many sales. In each certificate’s case, I had to make at least over $100k to be eligible to get into this, so that’s at least $200k+ worth of proof and I can tell you that specifically, when I got these certificates, I had made over $400k in a matter of 2-3 years. And next, we have a check for $20k+ which was an example of the types of checks I was getting during this 2-3 year period. Now if you want details on how I made these types of earnings, the 4th stage of this blueprint (where I give you examples of how to do affiliate marketing) will explain that in detail. 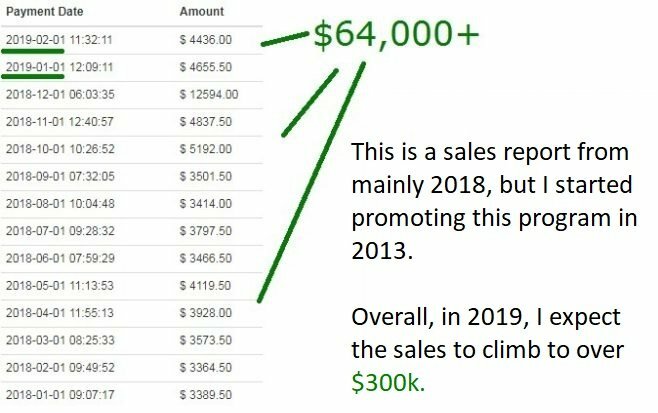 Now things did go stale after a few years of this promotion (I explain in a moment what happened), but since 2018, I also had a recent resurgence of sales from Clickbank described here. But the sales activity has been around $1,000 a month for this. 3) Wealthy Affiliate, the $200-$300k (and growing still). Details on this can be seen in this following report. But the short story is that after the above 2 opportunities either exhausted themselves and/or weren’t doing too well, I had to switch to something that would give me stability. Further evidence for this income report (and more income reports for that matter) can be found here. Why did I switch from promoting Clickbank stuff to Wealthy Affiliate? One of the reasons I stopped being so active on Clickbank was because the main product I was selling stopped paying people as much. I honestly think they just went out of business and I have no clue as to why, but Fat Loss 4 Idiots, went from paying me $20-$40 PER sale, to $0.01 per sale. I had to make an entirely new website. I had to learn a new way of making money online, which was blogging and SEO. Do NOT make the product you’re promoting the center of your promotion, focus on the niche instead! Promotional opportunities come and go and if you put all your effort into just promoting a product, and not focusing on an evergreen niche, then you risk losing everything if the product goes out of business, which often happens, even if things appear to be great! When it does happen, you are forced to (like I was) to completely switch everything around in your promotions and even start over in a completely different subject. That is tough as it is literally a business killer if you’re not prepared. Targeting evergreen niches on the other hand is far more stable because if one promotion runs out, you still have an audience that will buy from you so promoting them a different, yet relevant product can keep your online business alive. 4) Miscellaneous niche sites making me affiliate sales. One of these ideas was promoting freelance writing programs (this is a growing niche, and I promote one program on it here). I also engaged in sports activities called mud runs throughout the years and found out this had been a huge, and growing niche, so I started a page on that and made affiliate sales there too. I began a drone site almost a year ago and that too had some sales. However, I didn’t include the sales stats (the links above will show you them though) for these particular promotions because they weren’t that huge (Maybe a few $1,000 in total). And honestly, the program/promotion which brings the most money should be the one you focus on most, followed by the goal of scaling it, so obviously, I stuck to putting my time into promoting Wealthy Affiliate. Either way, these promotions are still active and making some sales. I haven’t excluded the idea of selling the sites associated with them, as doing so can earn me at least $10,000 on each, but I’m considering growing them in later times, and perhaps hiring some freelance writers to take care of it, since I’m tight on time. 5) Selling domain names (a snowball of affiliate sales). Wealthy Affiliate has a side promotion within it’s program where every referral you bring in, who buys a domain from them, makes you $1 every year, in recurring sales. $1 a year certainly sounds like a joke, but considering that I bring them 1,000’s of referrals every year (and it’s growing), and about 10% of them buy domains, that’s a few $100 right there, and being that they are recurring, I will make most of that money back the next year. Add to it NEW referrals who buy domains, and that’s the snowball affiliate effect I was talking about. 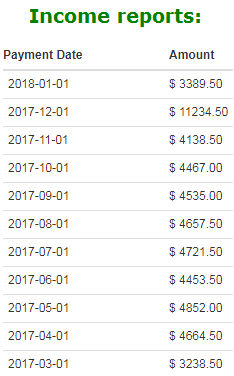 These sales are not part of the $200-$300k I was listing above, BUT they are part of my overall sales activities and it’s gotten to a point where I am making an extra $1,000 or more yearly (and it’s growing fast). Now it’s time to continue, so if you finished that first cup, time to go onto the second! 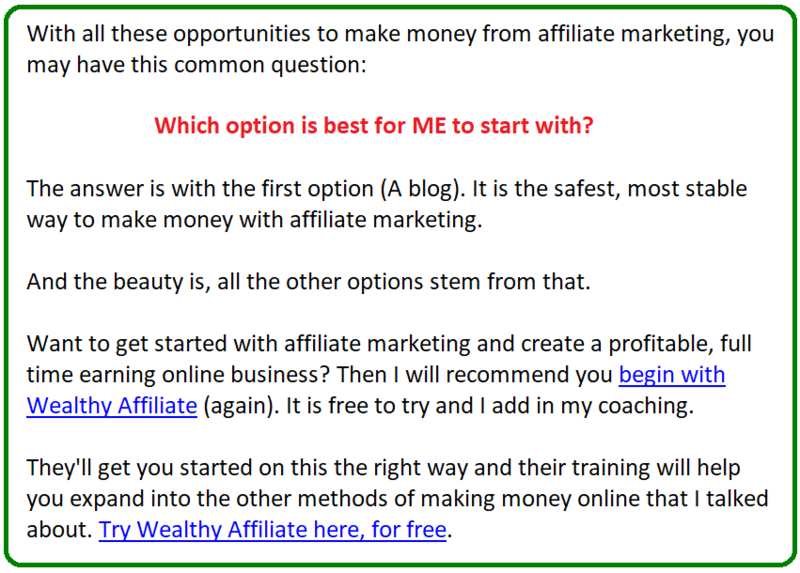 Part 2) What is affiliate marketing (AM)? An evergreen niche that is easy to sell to. A promotion to that evergreen niche that has recurring sales. These 2 things will provide an affiliate with STABILITY in this business and sales that are guaranteed to come in every month. This is one of the reasons why I promote Wealthy Affiliate most actively out of all my projects. The evergreen niche is people seeking to make money online. And the promotion is Wealthy Affiliate which shows them that and pays me monthly for each referral I get them. Everything else I’ve done before that promotion, during and after has been one time commission sales, and those carry their own benefits, but the stability of a recurring income model is what’s safest because you can expect money to be coming in from a source every month and not scrambling to look for the next one time sale to survive. Part 3) How Affiliate Marketing works (and how to get it right with 1 formula). I’ll be covering these options in the next section in detail, so don’t worry if this doesn’t make sense to you yet. The upside is that these numerous options present opportunity because there’s more than one way to do it. But on the other hand, the downside is that all these opportunities and options present confusion because people aren’t sure where they should best start. This is one of the CORE keys to all success in affiliate marketing, in online business, in ANY business for that matter. 1) It sets the most stable foundations in place for an online business to be a success. B) The passion and experience you have for a subject directly corresponds with the quality of the affiliate business you build. The more you know and the more passionate you are about it. Just reading this article, you can probably tell I have a lot of experience and PASSION for AM. Well that’s because I do and if you seek to replicate that success with your own future business, you NEED to find your passion that you can correlate with the other 2 ingredients. Here’s a good tutorial on helping you find that passion. C) A specific problem is imperative for AM success. The reason why is because the more serious, immediate and SPECIFIC a problem is for a person/audience, the more willing and ready that person/audience is ready to buy a solution to it. This is why a person who seeks to make an AM business will do better if they target something specific like stopping balding in men, vs someone who creates an AM site targeting health. Health is one of those things that has a lot of branches topics, and no sense or urgency. A man or woman who are losing their hair and scrambling to find solutions though? That is an example of urgency, and a specific kind. 3) A blog and/or YouTube channel is extremely cheap/free to start. With almost no risks involved in starting a blog (you just need to buy a domain name, aka website that’s about $15 a YEAR) and starting a free YouTube channel costs nothing at all. People mistake that these cheap costs mean you have less chances of success, when in fact, it’s the opposite. A blog can start from pennies of investment and REALISTICALLY grow into a giant business. A free YouTube channel can also do the same. Most people make the HUGE mistake of investing huge sums of money into programs, opportunities and systems that already charge them a ton upfront and when you filter out what’s good and bad about those investments, you find that the only real thing they pay a lot of money for is…coaching and advice. I’d rather you start an affiliate business with little or no money so if it’s not for you or if it fails, there’s no risk due to no money spent or a low investment at least. In the final part of this blueprint, I will be showing you how to begin with this, and spend very little or nothing because I honestly do not want you to be taken by the plethora of vultures out there in this business who really only seek to extract as much as they can from you because trust me, there’s plenty of people and businesses like these, who will give you the wrong impressions and take too much from you, even if they are good (rarely that’s the case). 4) It allows for adjustment/flexibility and the survival of your business. Having picked a good niche, having your own blog, and a YouTube channel (or both which is totally fine too), it allows you to control how you do things there. 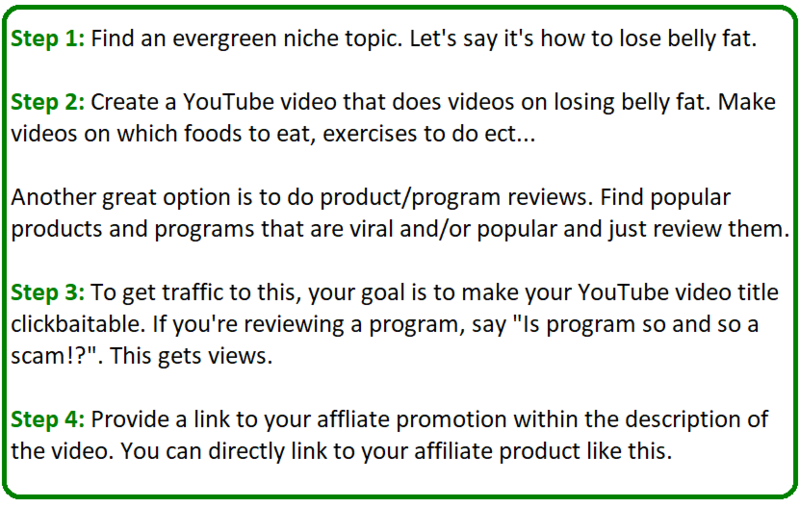 If an affiliate program collapses (which I have seen happen often and have been on the receiving end of more than once), you will still have the blog, the YouTube channel and most importantly the evergreen niche that’ll allow you to keep finding new affiliate products to promote to it. You can also switch later on from promoting stuff to even selling your own stuff there. Because the core things will remain intact, so will your business, and so will your income. Yes, it can hit roadblocks, but these core things in place WILL help you readjust and keep making money to survive. What are the best affiliate programs to make money with? I can name 3 that I’ve worked with and still do to this day. They pay on time, they are easy to set up affiliate links with, but it’s very important that your decision to pick one of these (or others that I will list), be done AFTER you have followed the 1 formula I listed above. It’s not the affiliate program or the product you choose that will keep your business going, it’s the evergreen niche. As long as this is chosen the right way, as is your marketing approach to leverage that evergreen niche, you can use one or multiple affiliate products and programs to make money from it, consistently, because it IS always going to be…evergreen. Now there may be some of you who are familiar with these programs I’ve listed who are wondering why I don’t mention any high ticket programs. I believe most of them are schemes and I list why here. Part 4) Seven (7) different ways to succeed at affiliate marketing. Remember, these 7 strategies are ALL based on the CORE formula I just covered in the previous section. None of these things really matter if the core things aren’t set in place, so everything I will be discussing from this point, begins from the core principals I listed above. 1) Running a blog, getting visitors to it and selling affiliate products on the blog. 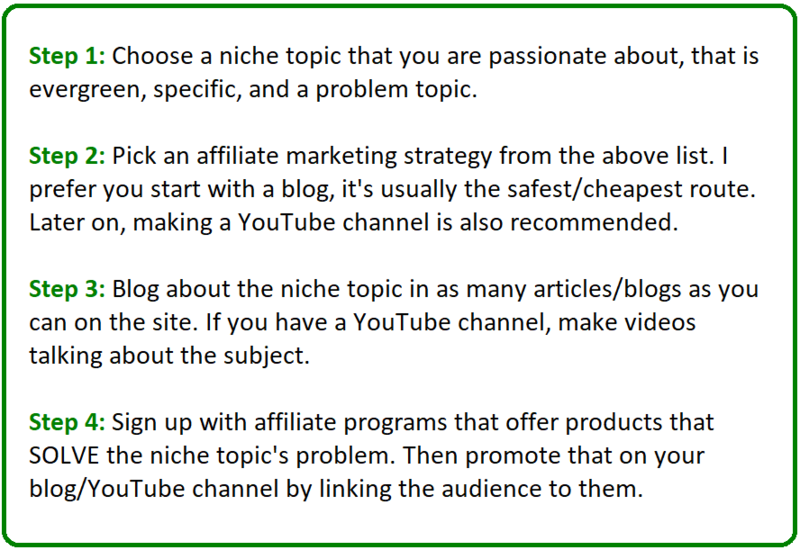 Your goal is to pick a specific, evergreen niche that you love and then you’ll make a blog that has articles talking about the evergreen niche topic, with the goal in mind to solve the niche’s problem. You will solve it by selling that niche audience specific products that do it. This is seriously one of the best foundations if you’re a beginner. It’s cheap, it’s flexible, and it all the opportunities to make you serious money. Here is one case study where I discuss how running my blog helped me earn full time. The beauty of blogging is that the only thing you really lose is time because generally blogs take about 6 months to start getting good traffic and the goal of the blog you’re making is to get the niche specific audience to your blog. All that is required for you to do this is to think up key phrases (keywords) these niche audiences type into Google and to write blogs with these key phrase in mind. 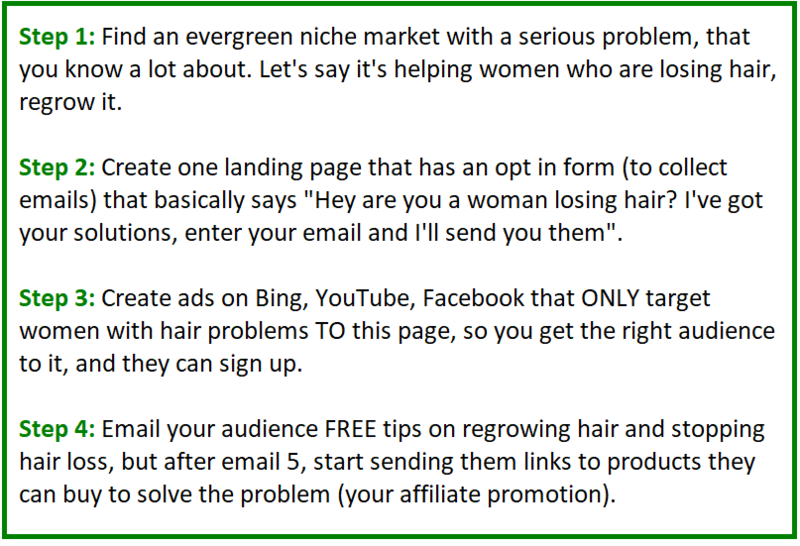 So suppose your niche audience is men with balding issues and one of the key phrases this audience types into search engines is “how to stop male pattern balding”. 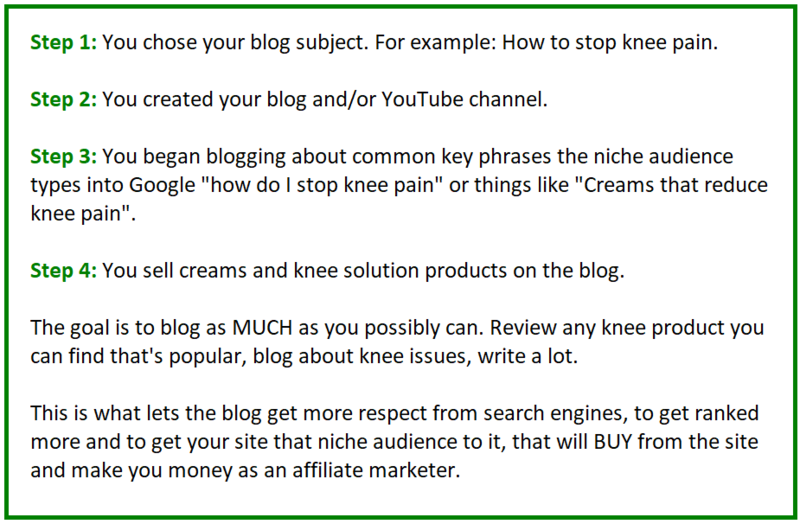 If you write a blog with THAT title and explain how to actually solve that problem, you will be ranked on Google and will have the chances of getting those people to your blog. Now for those who don’t write well or are impatient, perhaps this isn’t for you, but it’s still one of the most stable strategies for making money through AM to date and despite my high level of experience in this whole business, this particular strategy is STILL what makes up a majority of my success at this. I recommend ALL beginners start with this strategy. It’s the most cost effective, the most insured and the one which if you work at for at least 6 months hard, can really do well for you afterwards. 2) Running an eCommerce page but selling affiliate products on it. Setting up your own eCommerce store is not that difficult to do and in fact, the set up process of that is pretty simple, as you have good programs like Shopify and Oberlo available to help with that set up. The issue though is that most people do not understand niches and traffic and they don’t understand that for any site, blog, eCommerce or otherwise, for it to succeed, it needs to get that right, buyer traffic to it. I find that people make a lot of mistakes with eCommerce stores because of this incorrect way of thinking, which is why, when you apply the 1 magic formula I talked about earlier, it makes this process a lot more likely to succeed. I have described the way to make AM through eCommerce as safe as possible (in a financial sense), but it absolutely DOES carry risk because you will most likely have to pay for the niche traffic to get to your site. Pages that are eCommerce related generally do not rank well on search engines organically because they do not have a lot of content, so they need to BUY the traffic to make the money. If you’re a beginner, stick to the first method. If you’re not a beginner and have money, you can go this route, but you need to be advanced and know paid ads to make this work. 3) Running PPC ads to a one page site that sells affiliate products. The context here is that there are popular, BROAD subjects within which hot products come out for. Think about weight loss, which is NOT a niche I’d ever recommend you go with, but has people creating their own programs and advertising them. In some cases, these programs can go viral and have massive audiences wanting to buy them and research them online. And these things are what I call viral micro niches. These are niches that explode briefly in popularity but die out quickly. They are NOT evergreen, but when they are hot, they can make you a lot of money. The risk is putting all your AM efforts into this and expecting it to last forever, which it doesn’t, and when it dies out, so does your business. But never the less, such things present an opportunity for a marketer to see this trending and leveraging it. And this is advanced (not a beginner strategy for AM). For this to work, you need to often wait out a popular product to come into the market (any works honestly, but typically weight loss and fitness related products are easiest to sell in this example). The first one is here, where I made about $200,000 from selling a Clickbank weight loss program with this method. I have a second, which made me about $30,000, but it was short lived. I don’t have one to specifically show you for this, but it’s along the same lines as the case study above, except it was a lot shorter. I was promoting a diet program for an audience that was interested in a weight loss program for women (it was called PINK Method). 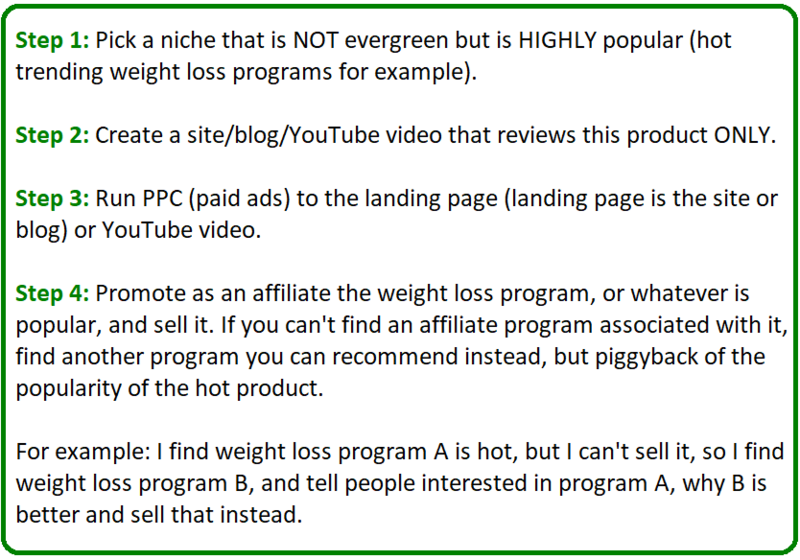 People wanted to know about a specific, viral method of losing weight, my article was ranked high for it, so I adjusted the article to explain how the method works and how 1 program (the affiliate promotion) will help them do it. This is what led them to buy it and make me the money. 4) Running PPC ads to a one page site and collecting a list, then selling AM products. If you can find an evergreen niche with a serious problem, and you can run ads to get these people to your site, there’s VERY good odds that you can collect a huge, buyer ready email list from this. If this formula is correctly executed, you can basically print money with it, but that is often hard to get right. I gave you the most direct way to get it right and I’ve used it before and made money with it personally (here is an example case study). But it takes high level skill to collect an email list and to get the traffic to your site, and to then also send the right types of emails to grow the trust of your subscribers, so they buy from you, but again, if this can be done right, you can literally just let the formula run and make the money easily. The hard part is getting to that point. 5) Creating YouTube videos and promoting AM products there. Selling AM products through YouTube is possibly the fastest and 100% free way of making money from it. If you’re not a shy person, and don’t mind showing yourself OR making a video where you record your voice and the screen (what I do), then this can work for you (here’s a free program I use). The only downside is that your channel isn’t completely under your control and many things can cause it go down (again, this leads me back to saying that starting a blog is the safest way to go). Note: This method involves making money without a website. You can honestly create an entire affiliate business THROUGH YouTube with this method, but again it carries risk, so my advice is to create a blog and make YouTube videos alongside this to make it a safer business model for you. Here is the link to the case study and you can also view the actual videos I have that are making me the money to use for reference. Second, I document a good case study from someone I follow on YouTube who makes a good income from AM through it. 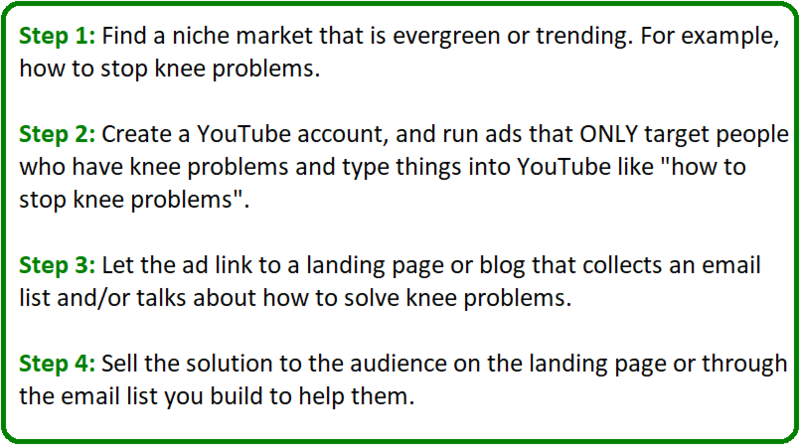 6) Running YouTube ads to your channel or website. This is what I have found and seen to work, and one of the reasons why is because top level marketers like Alex Becker do this too (however, they aren’t very good at teaching that in my experience). This is also one of the biggest strategies I’m seeking to master this year and will be breaking down case studies once they are available to show specific instructions. This however, is still an advanced strategy, so again, beginners, do the first option, trust me. 7) Create a website for a client, funnel traffic there and make sales for them but keep a commission. This is a realm of AM that is mixed in with other methods of generating money, but here you basically make a website and get clients to advertise their companies on it. Suppose you run a website on how to grow muscle and you find a fitness related company without an affiliate program that’s interested in advertising on your site (trust me, if you have a website with a lot of traffic, you will get offers like these). You can make a custom banner, offer a promotional code (discount), put it on the site, then when people click on it, it’s recorded and you can get the compensation for it. Again, this is for cases where a company you want to work with (or vice versa) does not have their own official affiliate program. I did this type of thing a long time ago with a local business I was partnered with. Part 5) Success stories. I’ve got many to share with you. Besides my own which I’ve documented throughout this blog post, I’ve got a lot to success stories I want to share with you that document people who used that 1 formula to make a great income through AM. Firstly, I have 10 people I personally know here that all began with the same 1 formula I have shown, made their income through AM and even expanded into creating their own services and products. Some of these guys have become millionaires. Secondly, I have another 10 cases to share here of people who also used this formula and also expanded that knowledge beyond AM. I don’t know all of the people on this list, but I can tell you that they are doing well and much of came from affiliate marketing. 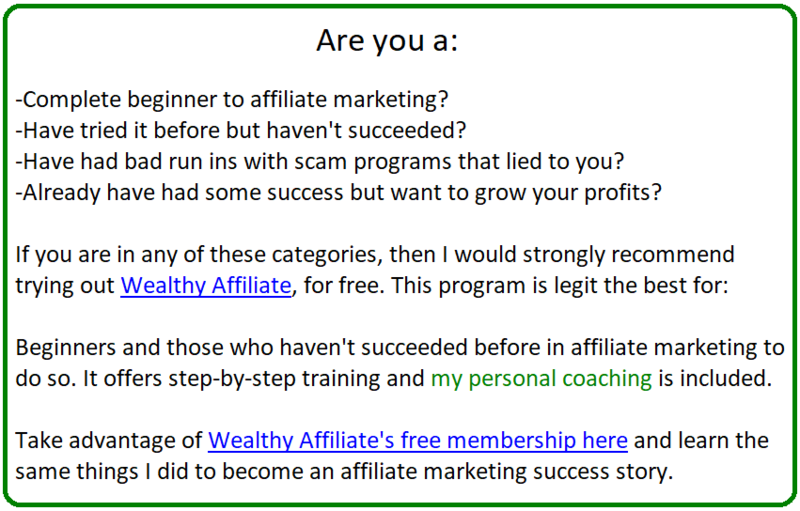 Thirdly, I have at least 10-15 more success stories, that are a bit more summarized than detailed, but in this case, the link I just provided will send you to a program I am promoting for any beginner to affiliate marketing, known as Wealthy Affiliate. Later on, I’ll be describing it in more detail, but this is the program that helped me get good at this (as well as the other success stories I’ve listed and linked to). This is the program you should begin with if you’re a beginner at AM. Part 6) Why affiliate marketing success rates are so low (and making sure you succeed). There is an unfortunate “unofficial” stat when it comes to this business and that is MOST people who try it WILL fail. First, the most common thing I find is that most people seek EASY, FAST solutions to making money with AM. With that type of mindset, the person is already basically saying they don’t want to work hard or go through the learning experience. They just want the shortcuts. If there’s anything you should take from my blog, the experiences I’ve shared and the success stories I’ve shared, it’s that this is not a get rich quick scheme. And everyone who has gotten somewhere in this business, from a few sales to a full time business worked very hard to learn and put it to use. Second, because in my experience most people seek easy solutions, they create an evergreen market for scammers to fool them into buying their horrible, “get rich quick” programs that look like shiny objects. In addition, lately there has also been a huge rise in high ticket programs that attempt to teach you to make money online and I briefly covered why I don’t use them above. Let me say, there is not a SINGLE high ticket program I’d ever recommend and here is why. In fact, I used to compile a list of the bad programs I’ve spotted over the years, and I had to stop because the list was getting too big. Now I just review the programs in their own separate blog posts and I find that’s enough to warn people. It’s ironic to think but evergreen niches can also be unethical ones, and this is certainly the case for this market. Paid online surveys are a great example in this subject (They are mostly horrible scams). Get a person seeking to make money online fast, offer them an easy, fast program, and you’re making easy money, even though it’s totally a scam. Third, there’s very little straight forward, TRULY beginner friendly, legit training out there that tells you this type of stuff and sets you straight from the beginning. I’ve gone through many, many programs and even with the few good ones, they very rarely tell you the best ways to start. 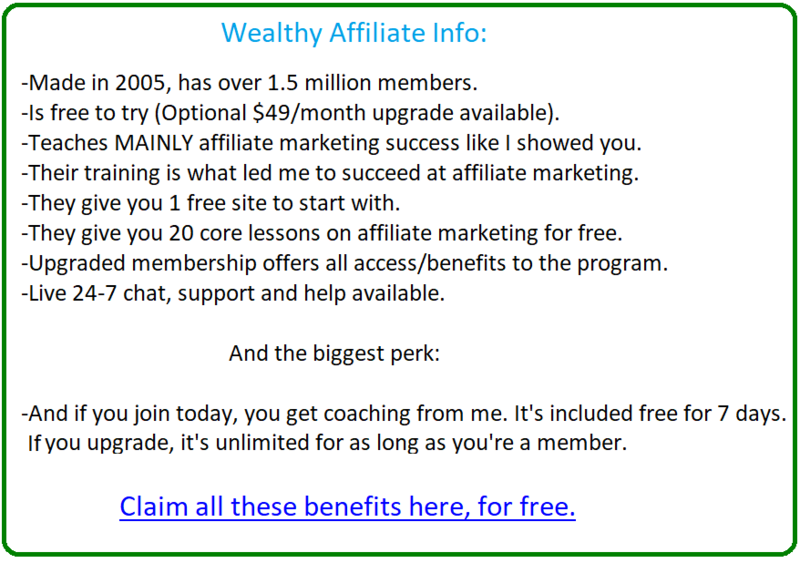 In my opinion (and actual results), Wealthy Affiliate is still the best place to start affiliate marketing if you’re a beginner because it sets you off on the right steps in all regards. 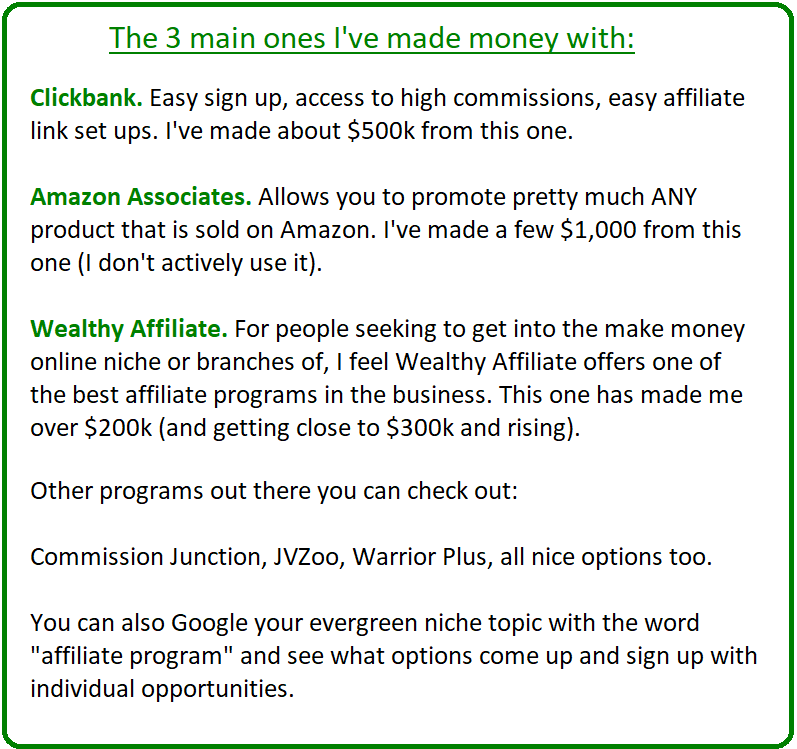 I strongly believe that if you can get these 3 particular areas covered, that you WILL be able to succeed at affiliate marketing. And I’m not just giving you examples of the mistakes other people make. I’ve made these mistakes myself and lost years, countless money and time in the process. By letting you know what I and many people have done wrong, it helps you get a fresh start and head the right way, the first time to make your success rate HIGH. Trust me, you do NOT want to make these mistakes, especially with get rich quick schemes. No matter how good they sound, do NOT fall for them. Part 7) The final section…how to start a successful affiliate business of your own. I’m going to divide this last part into 2 sections. My goal here is to help you follow the same steps I did to reach the point I’m at now and trying to help you reach too. And yes, in this section I am promoting something, that is very cost effective. 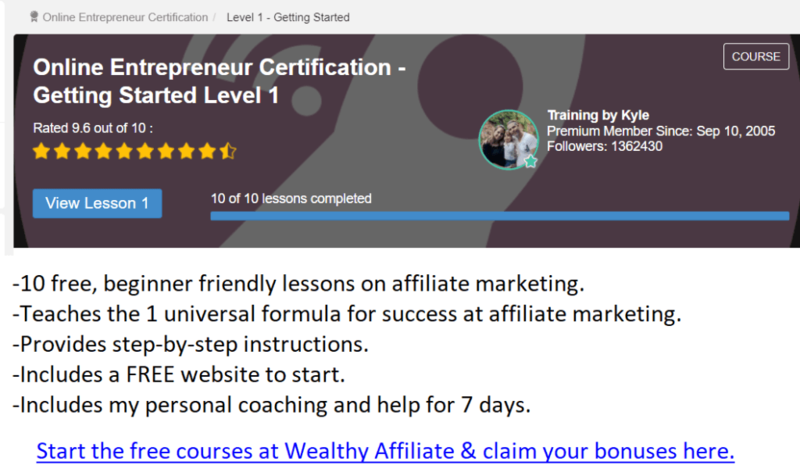 Section 1: If you’re already convinced of the things I said throughout this article and want to get a successful affiliate marketing business started from nothing, just join and try Wealthy Affiliate for free here, and do their certification training. They also offer a cheap, upgraded membership ($49 a month) that offers insane benefits, but it’s all explained in the free membership, among offering you great lessons and an actual head start in the business of affiliate marketing. And sadly most of the time, that potential is never reached in this business due to the issues I described in part 6 of this blueprint (Wanting quick results, lack of ambition, easily fooled into buying bad programs and bad training everywhere). Now of course, my goal as the promoter is to get you to join for free and upgrade so I can make commissions, but I’m here to tell you that it’s not mandatory (at the risk of losing sales). I’m never for forcing people into buying or getting involved with things that won’t help them. However, I am certain that if you seek affiliate marketing success, that Wealthy Affiliate is where you will want to do it through, so joining it for free, will show you that. And whether or not you wish to upgrade later, is up to you. In any case, there are truly awesome benefits of trying this for free, so that’s what I would recommend you do at the very least. My goal if you join is to help you understand and do the training within WA, so you actually become a success story yourself. That is the only reason you’d stick around anyway, so that is the main reason I am there to coach you and that is included with the membership, at no extra cost. Furthermore, coaching and good training is synonymous within WA, so you will be getting that, 100%, especially if you’re a beginner. To date, this is the LONGEST and most comprehensive article I’ve ever written on affiliate marketing (or any article I’ve ever written!). I imagine you probably drank A LOT of coffee while reading this. I have literally shared most of the profitable lessons I have taken from this business and even shared the ideas and actual case studies that have generated me the $1 million PLUS in sales. I have also shared success stories that I can prove from other people who have also made this whole thing work and this is all to prove that this business DOES work. I have no issue sharing this info with you and want to say that if you’re still skeptical or believe that you aren’t cut out for this, that it’s not true. I started with that mindset, with nothing and I built up my own affiliate business one step at a time, thanks to my ambition and Wealthy Affiliate. I know that this whole thing may feel intimidating (especially if you’ve tried it before) and the truth is that it can be IF you try to figure it all out at once. That’s NOT how you do it, you need to do it step-by-step and let each step build your affiliate business and that is what Wealthy Affiliate will teach you to do the right way, without getting intimidated or getting it wrong. I have been able to enjoy a lot of benefits out of life thanks to this business model and fully intend to go further with what I have learned. If you also seek to do this too, let me help you do that, within Wealthy Affiliate. It is the best way to start and get to this point too. I can tell you this because I went through it and so have many others who also started like me and became a success too. First off, I’d just like to say you have an amazing article here. It took me 30 minutes to read through everything you shared in your post. I also agree with you that out of the seven different strategies you mentioned, blogging seems to be the best to start with and of course, make a lifetime income since it doesn’t cost much and it’s profitable over time. I’ve also begun a YouTube channel that can help my blog get more awareness and clicks. But I’ve never owned an online store or engaged in PPC ads. Just as you mentioned those methods involve lots of capital so I’d rather build slowly and get to that point where I won’t mind spending some money on ads to drive traffic to the one-page sites. As you can tell from the length of my comment I really learned a lot from your website! Thanks for taking so long to read it Kemdi, I appreciate the lessons you took from it too and I hope to see you succeed in this business from this guide. Wow! What an incredible journey! I myself fiddled with blogging and websites for years on my own and knew the potential for affiliate marketing, but I just never stuck with it (until now). Though it wasn’t for any of the reasons you listed, it was mostly a lack of focus. But you are right for the reasons most people fail at this! I’ve seen people expecting to make thousands overnight without even basic effort in their websites and then get discouraged and quit because they’re focusing on money, not helping people. Thanks for sharing your experience with us! I do agree that out of all the so-called training I’ve seen online, Wealthy Affiliate is the best for beginners. Thanks again! A lack of focus is also a common reason people fail at affiliate marketing, but regarding the people who expect to make riches while doing nothing to earn that, it’s in part their fault, but it is also the fault of the many scam programs which make these promises (I’ve seen many!). Wow! Vitaliy that is a remarkable story. You give me great hope and determination to stick with the plan. I started promoting Wealthy Affiliate six months ago, and my web copy looks nowhere near as polished as yours. Where did you learn to write a copy like that? 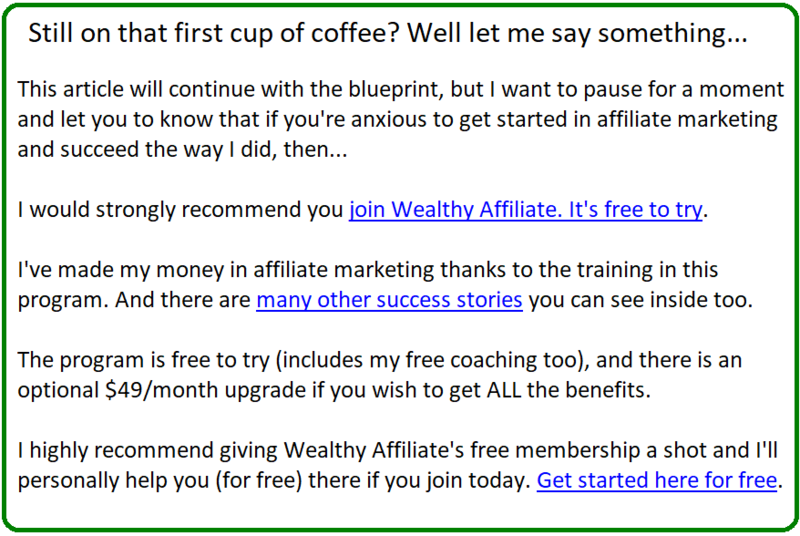 I was well into reading your web page, and I wanted to join Wealthy Affiliate, but oh, I already have. I have a lot of catching up to do. Maybe in ten years time, I will have a story like yours. Hi Paul, there are no secrets in the way I write, it’s just something that has come from many years doing affiliate marketing, writing about topics, keeping the reader in mind and what they may be thinking or asking about and of course providing helpful content. I honestly do not think that you should focus on seeing results in 10 years with Wealthy Affiliate, and as long as you write content on your website the open way you wrote your comment, I think you’ll find that time frame to success will be much shorter than you think. Wow Vitaliy, once again you have outdone yourself here. I visit your website regularly for all the amazing content and the hundreds of helpful posts you have published. However, I have to say that this time you have gone above and beyond. It took me 1 and a half hour to read every single line of your article, so my coffee was long gone by the time I was all done. The part that intrigued me the most is PPC. I know that this is one of the most profitable ways of doing things if I want to scale my online business but I have never jumped in or even considered putting money in it yet. The main reason is the fact that my website, even though it has been online for about 15 months now, only has 75 articles on it as of today because I still work my 9-5 job and my “business time” is very limited, but traffic is starting to climb now. My main focus right now is doing reviews of MMO digital products and offering them the WA solution, which is a good “free” method to get traffic to my website. My articles have started to rank and I do get referrals but my conversion rate is very low. 1) You mention that we should pick a niche that is NOT evergreen. Does this mean that in order for PPC to be profitable, I should focus on a specific digital product and not promote WA on a landing page? 2) My second question is how do we create an ad that targets a specific audience? You probably have an article on your website for that one but I couldn’t find it and would be grateful if you could direct me to one. I also would like to thank you for directing me to ShareX. I have to start using YouTube, and being camera shy, this program will help me get going without showing my face if I don’t want to. In summary, this article (we could almost call it a small book) has given me a whole lot of new information that I did not have yesterday. I still consider myself a newbie even if I have been doing AM for a few years now because of my time restraint. I would like to thank you for being so honest and transparent! In my experience making money with them, I have found that the more relevant a product review or topic is to Wealthy Affiliate, the easier it is to pitch it. I find that programs that are of the make money online realm, but not directly related to WA and it’s services tend to not convert well. Here are some examples: Survey sites and rewards sites. You can do reviews on programs, but pitching WA to them is tough to convert as these people do not really understand affiliate marketing, and they expect easy money from answering surveys or getting points for simple actions. For those types of reviews, you need to let them know about what they’ll be doing inside WA and why it’s the better way to make money for that conversion rate to rise. 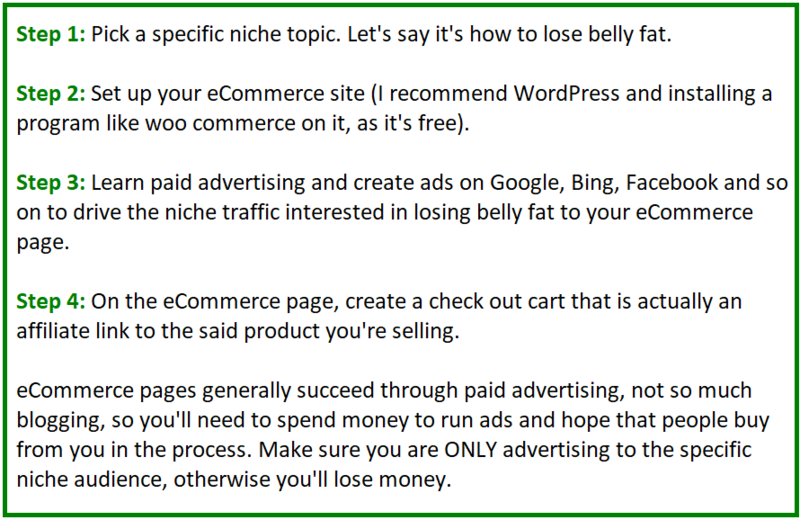 You can absolutely monetize an evergreen niche via PPC methods (and it’s a great way to build a list fast). What I did say was that focusing your niche on a PRODUCT, which is not evergreen is not going to lead to long term profits, which is why an evergreen niche, which is in demand and will be, is the way to go. There’s nothing wrong with setting up a simple PPC campaign and promoting a product through it and I do recommend that, but if the product drops out of popularity, so will your PPC clicks and profits. And this doesn’t mean you shouldn’t still do it. It just means that you shouldn’t expect the profits to keep going, because the product WILL eventually go away. I make my site focus on an evergreen niche and review products on it. Then I set up PPC campaigns that target those products and lead traffic to the review of the product. This is a great way to keep traffic flowing in and if the popularity runs out, I still have the niche site that continues to draw in traffic. 2) The PPC network I’m referring to in my article is Bing Ads. For that one, it’s very simple to draw the laser targeted traffic to the page as you only need to input the keywords you wish for the specific audience to see. And here is the article on that. Good luck with your WA site! I can’t say enough about this article. Anyone who reads this wealth of information you have provided here should be inspired to know they can do this. I know your method on using PPC ads on a hot product, it might be a bit risky, but the possible rewards are huge as well. I am familiar with the methods taught by Wealthy Affiliate, and I have no doubt using those exact methods will produce results. You have given away some real secrets here, but aren’t you worried about someone coping your success? I am certainly glad you did, because I am going to set up a YouTube channel and make some future videos. Thank you! People can theoretically take this article (or any other I made), copy it and try to promote their own stuff, but how would that serve them? Google would see their copying as duplicate content and punish their site, so that’s a dead end. People can also try to copy my strategies for PPC, but then they still have to understand how to work with PPC networks and properly structure their landing pages as well as target the right niche crowds. And that itself presents many obstacles that beginners will not be able to “just copy” and succeed with. The thing is, copying people’s strategies and content is not as simple as it sounds, because the person doing it still needs to have experience in marketing that stuff. I only seek to share the things I learned about succeeding at affiliate marketing with the goal that people who read it, will use the strategy, but in their own, unique way to accomplish their own goals. What a well written article that really goes deep into the nuts and bolts of affiliate marketing. You cover everything, even how much money that you have made. I’m seriously impressed. The list is endless. Well done! This is a super article, and very well detailed. I’m very much impressed with you showing practical evidence of the way you have made $1 million through affiliate marketing. I’m so fascinated with all the facts and figures you’ve provided here and how you have made affiliate marketing success possible. I will definitely bookmark your website to learn from from you. First of all, it’s 5pm here, so coffee is out. But don’t you worry, Vitaliy, I grabbed my glass of wine instead, and I enjoyed every sip while I also enjoyed every word of your article. I’ve been in the affiliate marketing business off and on for quite some time, but you never fail to teach me new things. And you also really inspire me to keep going, even when it seems like things aren’t happening. I love the success stories that you shared (including your own) of the people who stuck with it, and how it has paid off in the end. Affiliate marketing is certainly no get-rich-quick scheme and I’m glad you pointed out why people fail. I wish there was a magic button that we could push to automatically send information to people’s brains that shows them that, yes, they have to put in the work upfront, but that work will eventually pay off. Not only that, but what’s better? Sitting at home (or Starbucks) and typing up articles, or sitting in some boring gray cubicle for the rest of your life? Anyway, thanks for the pep talk. I know it wasn’t directed at me, specifically, but I appreciate it anyway. You reminded me why I love the affiliate marketing business so much. This is definitely one of the best and most helpful and inspiring posts that I have ever read. Anyone who follows the links on your post will find more and more great info. My favorite was the item about ShareX – I think that that will help me at last to overcome my diffidence about making videos. It is so kind of you to share your blueprint to success, and I would like to congratulate you on that success – it gives everyone hope that they will be able to emulate you in some way. I would definitely like to endorse your recommendation for Wealthy Affiliate, as that gives everyone a launchpad into the world of Affiliate Marketing, and as such it is invaluable. I really can’t thank you enough, and I will be coming back to your website for more amazing help. No problem Chrissy and great analogy on the launchpad and Wealthy Affiliate! I want to commend you for such a passionate post and despite the length of this, I always feel this rush of excitement and drive to succeed once I read any of your posts. I am still new to trying to build a business online and most of what you talked about, I can relate to, like at first having so many options and “gurus” telling you what to do as a beginner is overwhelming but joining Wealthy Affiliate and staring to go through the courses has helped me. I am beginning to find a deeper understanding and how best to put the tools together. Reading stories like yours and seeing your result is an inspiration and I know this would pay out in the long run. Thanks for keeping me on my toes. Never stop writing. Thank you so much! And I fully intend to keep blogging this way, I’m glad it’s helped you as well. Wow, what an inspiring article, and I hope in another five years time I can also say that I have earned as much as you through affiliate marketing. I also love it when I get sales through Clickbank, as their commission structure is really good, however it does take a bit of time to find a good product, as a lot of their products are just not worth promoting. I will take your advice and work to sell Wealthy Affiliate memberships, as at least I know that this is an excellent product that has been going for years, and probably will still be around for years to come. Hi Michel, WA is a great product to become an affiliate for. I would recommend going that route if you have existing experience with making sales through affiliate marketing. WOW, Vitaliy. You weren’t kidding about this article being long! The parts I liked the best are your earnings story and the people you know and have met personally. I follow all these people and have read (not all), their WA posts. These people really know their stuff and each one of them has helped me out at one time or another and, even though, in essence, I am a stranger to them. That’s pretty awesome. All of these and more, are an inspiration to many of us to not to give up and to keep moving forward until we too find success. Not sure if this is the place for this but, you are also an inspiration to me as well. I have fallen back a bit. That’s on me and mostly because of time constraints and, yes, procrastination. I don’t do well when I’m tired, because it’s hard to focus. That said, I am retiring at the end of this month and will be able to spend more time on my sites. You and the stories of others have served to keep me interested. So, thanks for this post and thanks for your help. I will be back to read it again. WA Rocks. Going to do this! Wow. With your style of writing, everyone would want to purchase whatever you have. Seriously though, there is so much information here and good examples that I can say I have had the best lesson in AM so far. I will be checking out Clickbank and doing more work on Wealthy Affiliate, as I am a fairly new member. But I am so motivated now. I have to tell you that was more than one cup of coffee! You have covered a lot, thank you. I have been thinking of finding a way to make money online, see myself on a beach, with a laptop and one of those umbrella drinks. Is it really like that? How many sites do you have at this time? Should we start with just one site or is two or three better? Do these sites cost much money? The email marketing option sound good, but difficult, is that because of the timing of the email? 1) The whole beach and laptop thing is overrated and people like to use that are a marketing gimmick. While I can totally do that (so can the success stories), I’ve sat on the beach before and thought about this idea and with all the wind, the sun making it hard to see the screen and the relaxation being the major thing, in my opinion it would be hard to focus on business. I like to work at home, when it’s quiet and when I am hungry. This combination of things makes it easier for me to focus and produce content like I am in this article. 2) I have a few websites, but start with one. I framed this article to help you begin affiliate marketing successfully off one site and that CAN be the main money maker if it follows the techniques I laid out here. Starting other websites is not a bad idea, but considering how much work there is involved with it, doing it alone will be difficult. In terms of costs, to do this particular stuff I’m doing, you need a domain and a blog. The domain can be purchased for a very cheap price ($14.99 a year) at Wealthy Affiliate’s domain registrar. Then installing the blog to this site is free and simple. So that should be a good, cheap starting point that works perfectly. This blog started that way. 3) Email marketing isn’t really difficult, but it is another layer you’re adding to your online business. It requires experience, testing, patience and paying about $20 a month (for a cheap but good autoresponder) to carry all the emails you collect. But all of this is still 1 layer and it’s actually the one I’d worry least about. The website you create, the evergreen niche you target and IF you can bring traffic to the page is what really counts here. If you can’t do this type of stuff, there is NO good reason to start with email marketing, worry about that later and study up on evergreen niches, generating traffic off them to your site and doing affiliate marketing. If you can do this, evolve to the next step which would be email marketing. And you can learn all of that with Wealthy Affiliate. They are one of the few programs I’ve been a part of that told me the truth about email marketing and how much money it can cost as well as time. This article is absolute gold, Vitaliy! This really is the best guide on affiliate marketing that I have come across with zero fluff, actionable steps and all backed up by proof and case studies. I’m super impressed! One thing that strikes me, is that you come across as very humble, but making over a million dollars, isn’t the norm. I find that most people really struggle with the belief that making this sort of income online and through affiliate marketing is possible for them and rarely get anywhere near this level of success, but here you have outlined that it is very possible with the right strategies, support and work ethic. You’ve obviously worked extremely hard over the last 15 years to achieve these results, but I’d be interested to know what you think is the number one reason why you have been able to achieve this success when most people never get anywhere close? Thanks John! There isn’t a single reason I could point to as to why most people fail, it’s always a combination, which is why I did lay it out in 3 main points on this very same article. In summary, a combination of laziness, shiny objects distracting me from working the right way and limiting thoughts all contribute as to why this happens, not just for me, but MOST people. Wow! This is awesome! I must say that even with my one year online, I just realized I still have a lot to uncover. It must feel like a dream to learn that you actually made a million in affiliate sales over the years and I hope at some point in my journey, that I can confidently tell a story like this too. I am presently with Wealthy Affiliate too and taking each step, one day at a time, and everything in your guide definitely goes in line with what we are being thought there (Although I love your case studies. Really inspirational). I am confident at this point that I belong to the right training community that will offer me the right help I need, and alongside your guide, I hope to implement these ideas and hopefully have my own success story too. Thank you for helping me build more confidence in what I am doing, its been there though, but after reading this guide, I have no doubt I am on the right track. I’m glad that you read this guide and are also doing the Wealthy Affiliate courses Queen! Thank you very much for your post. I really liked how in depth you went into the explanation of affiliate marketing and its benefit. I do have a question though, what were the setbacks you experienced at the early stages of you being an affiliate marketer? I did not know the field is that big nor did I know someone can earn as much as that from being an affiliate marketer. I was literally astounded by your accomplishments and was at the same time motivated to take my online business seriously as well. 1) Selling your own eBooks is very possible and profitable, but I literally had no experience when I tried this, and that made the project I was engaged in fail horribly. So that was a major setback, especially mentally because of how much time I put into writing a good quality eBook. 2) Paid online surveys have always been and always will be a waste of time to do in my opinion. Only if you promote them, can they work, but I would dare say promoting them is unethical because they pay their members so little. This was also a major setback because I had already failed before, and I really went into trying to do paid surveys with the hope and belief that this particular would work for me this time, but it didn’t. So that was also a major issue I had to mentally recover from after I realized how awful this was. But it was after I tried these things (and that was about 1-2 years with no results), that I got into Bum Marketing (from an experienced friend), which led me to article marketing, and that led me to Wealthy Affiliate, after which I got into affiliate marketing and other projects. I really liked how in depth you went into the explanation of affiliate marketing and its benefit. I did not know the field is that big nor did I know someone can earn as much as that from being an affiliate marketer. I was literally astounded by your accomplishments and was at the same time motivated to take my online business serious as well. I do have a question though, what were the setbacks you experienced at the early stages of you being an affiliate marketer? Like, what were those things that initially hindered your progress when you were still new to the online business world? As I’m sure it did not just click for you overnight and would love to learn from you. Hi Tohin, I went through a period of figuring out what programs I could trust and also was looking for easy solutions and didn’t get anywhere for a few years. I did mention these same points in sections of my article towards the end on why rates for affiliate marketing are low. Wow, you have a lot of great information just on the one post. I’m happy to see what you’re making with WA, because that’s where I’m working from. I want to sit down when I have time and go through everything you have written. You are obviously one of those gurus we newbies fondly think of when we are working on our websites. I especially want to look at the evergreen niches, so I can get at least one niche that makes money while I’m dabbling in my hobby niche. Anyway, good job on the post and good job on the affiliate marketing career. Why not cross reference an evergreen niche with a hobby? People often think that the niche they choose for making money and the niche they love have to be separate, but this is not true at all. You can connect an evergreen niche with say an experience you have had in life. For example, someone who stopped their addiction to smoking can start an evergreen niche site on how to help others stop smoking too. This could work very well.